Website Design Flooring Contractors Hampton VA | VISIONEFX provides website design in Hampton VA providing on-going organic SEO work that attracts online leads and new projects for Just Floored. 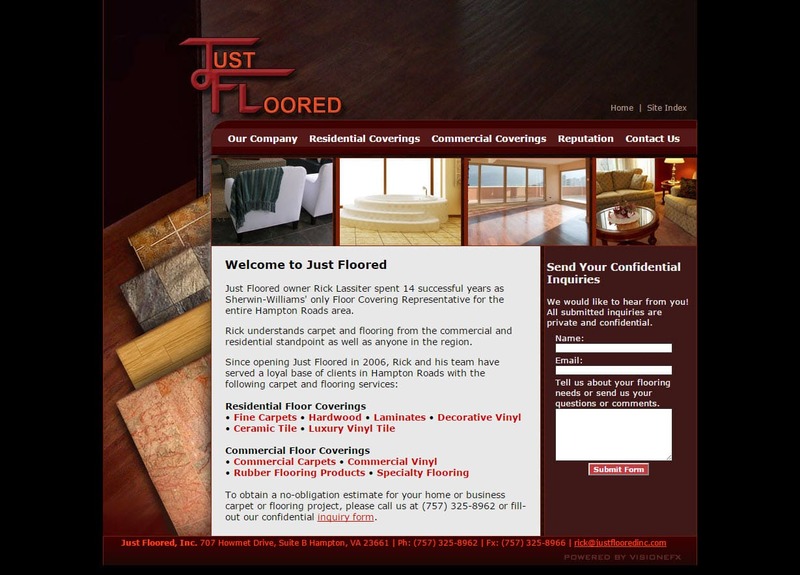 Just floored desired to have a easy to navigate website and also have thier website found in the Google results for Residential floor coverings and commercial floor coverings. This flooring business is located in Hampton, VA. Search ‘Website Design Flooring Contractors Hampton VA’ find the experts at VISIONEFX for all your website needs. • Web design for stone tile contractors. We provide Web development, E-commerce design, Database programming, Word Press web design, Joomla web development, SEO ‘Search engine optimization’ and Website maintenance services. Call VISONEFX at (757) 619-6456 or email direct to info@visionefx.net.